Today was a rushed, hectic day, full of too much activity. I got my daughter to gymnastics, just on time, and sat down to catch my breath. When I looked up, I noticed the American Flag hanging in the back of the gym, in really interesting light. I knew if I metered my camera for the bright light on the flag, that most of the area around the flag would go dark. I tested my theory, and this is my dramatic result. 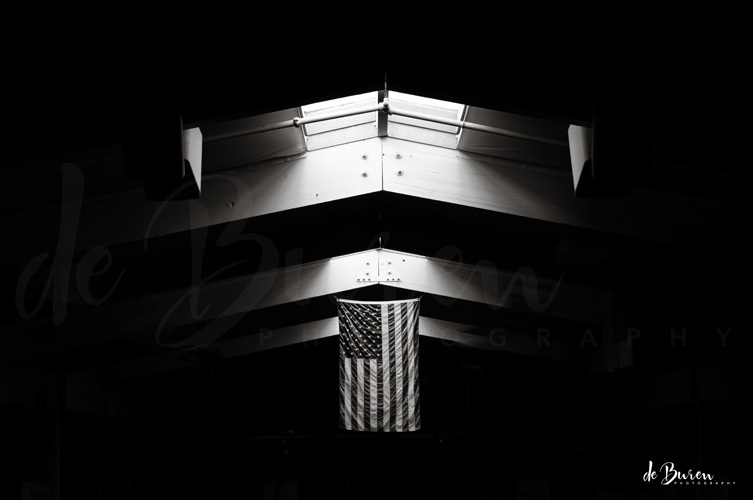 This entry was posted in 365 photo project, Black and White Photography, Flag, negative space, Photography and tagged 365 photo project, American Flag, © Jean H. de Buren, black and white photography, de Buren Photography, negative space, Nikkor 50mm 1.4 G, Nikon d90 by Keep Opening Doors. Bookmark the permalink.